Home- Six Sigma Training- Six Sigma - What is DMAIC? Six Sigma is a statistical control device and a form of root cause analysis that seeks to reduce failures in a process to just 3.4 failures per million measurable opportunities, through a structured problem solving system. 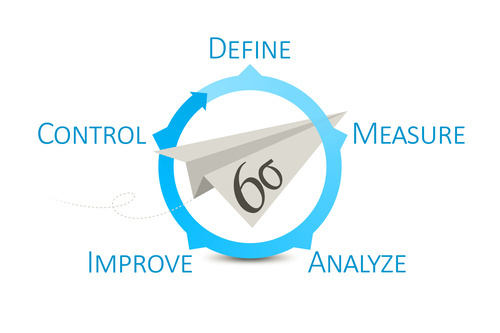 Think your business could use DMAIC to improve processes and profits? What is a DMAIC process? Articulate the problem and use standard Quality tools to prove that it is actually the problem. Isolate the specific problem and then put it into perspective in relation to the rest of the business. If, once analysed, it’s not the problem you thought it was, it may not be worth spending time and resource on - but you won’t know until you can gauge the issue. Establish baselines in the process by measuring how well it is doing against expectations. This means collecting and reviewing the available data, which may mean sales against forecasts, production line failures against throughput, or customer complaints. Identify and understand the reasons for failure or poor performance. The car won’t start. WHY? The battery is dead. WHY? The alternator didn’t supply energy to the battery. WHY? The alternator belt is broken. WHY? The belt was used beyond its recommended replace timescale. WHY? Forgot to check when to replace the alternator belt – human error. We have now deduced that the car won’t start because preventive maintenance wasn’t carried out when needed, and it has resulted in catastrophic failure. 5-Why’s is only one tool available and others such as Fishbone, Failure Modes Affects Analysis (FMEA) , or Voice of the Customer Analysis – or even a combination of them – may be required to get a full picture. Finding the problem may take the greatest amount of time in this process, but it must be done thoroughly or you can be at risk of not having found the root cause and the problem recurring. Be sure that you actually find the root cause of the problem before trying to fix it. However, be rational - with the above example of the alternator belt, we could go on to ask why the belt wasn’t replaced in time, and what could be put in place to ensure that it doesn’t happen again, but that could be seen as a step too far. Test and then implement a solution to the original problem. With the problem identified a robust solution can be put in place. Because the root cause has been found you can be assured that the problem – in that particular form will not happen again. There may be more than one answer so all possible solutions need to be reviewed and the benefits of each tabulated, with the option that benefits the company the best being the one that is adopted. The improve phase may also lead to other, knock-on, improvements in related areas of the business, adding to the overall benefit of the change. Monitor the change to assess the impact on the original problem. The control phase is important as it signifies the sign-off of the problem and disbandment of the project team. While the issue should now be completely resolved, a suitable quality professional will monitor the original problem to ensure that it really is the case. 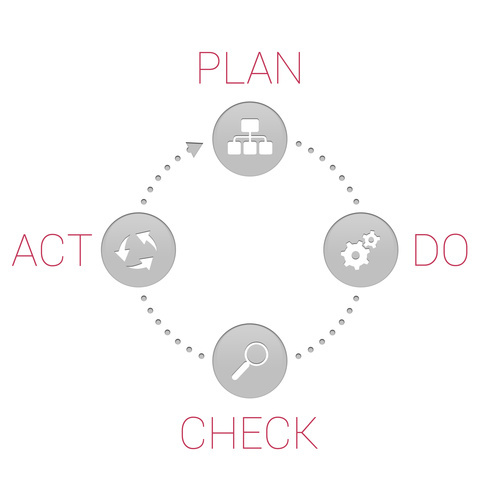 The DMAIC process is based on W. Edwards Deming’s Plan-Do-Check-Act cycle, used for the control and continuous improvement of business processes, products and services. At this point, we introduce two more Quality terms; KPIV and KPOV. The term KPIV is an acronym standing for Key Process Input Variable and relates to the parameters preceding a process under review and how they may affect it. The key inputs may be physical, such as manufactured product, or notional items that affect the customer like price, durability or features. They are the elements that affect the product service or process at that particular point in it business journey and which may have some impact on it. These are the factors which may need to be examined in detail in order to determine the appropriate ones – key means just that; the elements that directly impact the problem. Similarly KPOV stands for Key Process Output Variables and relates to the outputs from the process or system. It is these outputs that eventually become the inputs to the next process or system along the line. As with any process-led operation, the next person along the line is a direct customer and care must be taken that issues apparently cured in a Six Sigma exercise are not simply passed on up the line to become a customer’s problem. The process capabilities of each KPOV need to be measured before any changes are made so that a direct comparison can be made afterwards to gain a realistic picture of how the altered process is performing.